Hello from injury sofa again! If you’ve had an injury that has kept you from doing the things you like doing, I know you can relate right now. While most of the time I can keep in mind this is only very temporary, sometimes I let a little discouragement crept into my mood. I always try to live my life in a positive atmosphere, anything else is a waste of time for me as I strongly feel it stagnates any goals and precious time we have with our friends and family. No matter what the situation, there is ALWAYS something good in it. Off my soap box now, so let me give you an update on my back. Last I shared, it was doing great from the prednisone the orthopedic spine doctor gave me and I was hopeful to return to my normal activities (with caution) 2 days ago. Only I had a little set back 4 days ago when Andrew and I decided to go play pickleball. Yes, it really was feeling that good that I had the confidence to resume activities. Prednisone did it’s job at calming that disc so wonderfully all of the pain was gone. UPDATE: Now I have this massager that I can use to help loosen tight back muscles to add another resource to keeping a healthy back. All was well for about 45 min playing. We had played a few games of mixed doubles with some friends when I went for a low bouncing ball and BAM, my disc slid out once again. Needless to say, Andrew felt really badly about suggesting we play, but I knew it would have happened this week regardless. That day it was back to square one with horrible pain and nerve pain shooting down my right side. Returning to the doctor on Monday for followup and as we talked about last week, an MRI was scheduled. Thankfully, the MRI machines are not the coffin they used to be. I can usually tolerate almost anything, but just in case, opted to take a Valium for the test just in case. Also, in preparation for the MRI, wear clothing without any metal. If you can do this, you don’t have to change into a hospital gown. 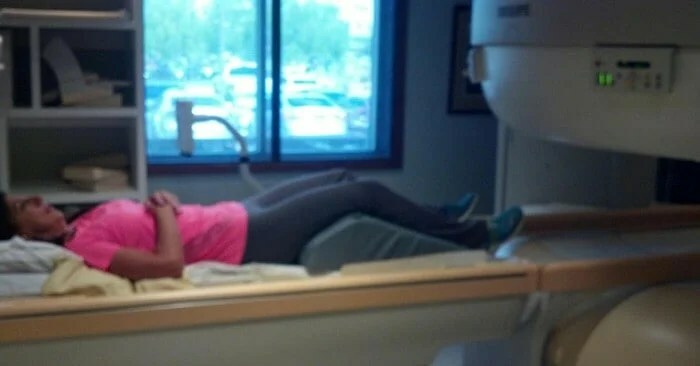 Whether it was the Valium helping or not, the MRI was a breeze. It was an “open MRI” machine so instead of the old style coffin, it was more like a hamburger bun opened. The noise is what has been as difficult for me as the coffin claustophobic feeling. So while they have improved the design, the noise is the same, even with the double ear plugs provided. The “hamburger bun top” was still only a few inches away from my face, so I just kept my eyes closed so it doesn’t become an issue for me. Happy to report that the 25 minute scan seemed like about 10 min and I was in and out of the center in less than an hour total. Once home, the full effect of the Valium kicked in and I slept for the next 3-4 hours. I asked the technician to snap a quick pic after the procedure, it’s a little blurry but it was nice of him to help a girl out with a blog pic! My suggestion if you take a Valium for an MRI or some other type of test, have a plan to call someone to drive you home if necessary. Thankfully, I only live a couple of miles from the MRI imaging center, and the Valium had not kicked in fully or I would have definitely called Andrew to pick me up. He knew it was a possibility and was more than ready to come if I needed. I have an appointment this morning to find out the results of the MRI. The next planned step is for me to go to the Pain Clinic for a cortisone shot in my back, presumed S1 disc, to be able to be pain free and return to activities in a few days. Of course, I will let you know. Meanwhile, I know many of you may be suffering from similar injuries that keep you from doing all of the activities you would like. Time jump back to my first experience with a bulging disc…in 1999-2000 I had disc problems in my neck. The disc would bulge from time to time and basically caused pain for about a year before I went to the doctor. Once I had surgery for it, I kicked myself for not going sooner. I hope that you are not suffering with a pain without seeing a doctor. In my case, it really was not at all worth waiting so long. I ended up having 2 surgeries within a couple of years to repair discs. It’s about quality of life, right? While I realize not all injuries or ailments can be cured easily or sometimes not at all, we should do what we can so that we are happy with our quality of life. If you have an injury or ailment preventing you from enjoying life fully, maybe today is the day to call a doctor and seek options to improve your quality of life. 1- Talk to your doctor about a Valium or something similar to ease the potential anxiety, but be prepared to have someone drive you home afterwards and once home, plan to be able to sleep for a few hours. 2- Wear comfortable clothing without any metal. Have a great day! I am off to my follow up appt to get the results of this MRI. What has your experience been with an MRI? Have you had a cortisone shot before? If so, please share tips with me in case I do have one soon.